This book is both a survey of practical concepts for forecasting the performance of various telecommunication systems as well as a balanced treatment of space-weather phenomena that give rise to telecommunication impairment episodes. It bridges the gap in the relationship that exists between the following two disciplines: space weather and telecommunication system performance. There are a number of books that address one of the two disciplines in some detail, but only merely mention the other as an afterthought. In this book the author has married the two disciplines so that the readership can see the connections more clearly. All professional and academic researchers in the fields of telecommunication science and technology; military and civilian telecommunication; applied aeronomy and ionospheric physics; and space-weather will find this book essential. It will also be of interest to professionals and researchers in the fields of solar and magnetospheric physics. Divided equally between Space Weather and Telecommunications, the author presents a non-mathematical view of the solar-terrestrial environment known as space weather and how it impacts radio communications of various types.This relationship is examined essentially for predicting and forecasting variability in communication outcomes.Emphasis throughout is on interpreting the numerous published scientific studies to better understand this impact. The author writes chronologically and often describes his professional experiences as if recording a scientific journal or diary.Thus it is easy to follow the complex threads of physical science inquiry as he travels from meeting to meeting where other scientists also present their findings.One need not be a mathematician to interpret the meaning of a few dozen equations.A Bachelor's degree in Physics, a related science, or engineering will suffice tocomprehend fully the concepts. In the first part, attention is given to the Sun, the Magnetosphere and Geomagnetic storms, and the Ionosphere.There is an excellent summary of recent work in modeling and prediction and the author makes a point that "...we are now unfortunately faced with the job of predicting outcomes from models driven by parameters that also need to be predicted..." and continues on to address the uncertainty in this process.Readers engaged in the space weather field will find an excellent overview of the topic, which includes storm and ionospheric modeling, but few surprises. Attention is given to ionospheric layers, sporadic-E, solar flares, European Union COST Action models, and scintillation models.A significant feature of the first part is that the names and organizations of researchers are cited. This allows the reader to reach into the literature for additional technical details of this research most of which is recent or current. The second part is devoted to studying propagation in the bands from ELF (<3 kHz) through EHF (30-300 GHz) which is essentially the entire real-world telecommunications spectrum. The growth in technology, including the extensive use of Global Positioning (GPS), suggests that this part has many innovations, particularly in the HF spectrum, in which the author makes the connection to space weather. Such well-known topics as waveguide, wave-hop, skywave, groundwave, skip and skip distance, ducting, scatter, OTH radar, MUF and LUF, scintillation in earth-space, Doppler shift, Faraday rotation, and absorption are examined.Attention is given to modeling of the scintillation channel along with mitigation schemes. There are discussions of HF system performance models including: IONCAP, VOACAP, ICEPAC, ASAPS, and REC533.Because satellite communications is expanding, the author explores refraction, path delay errors, radiowave trajectory, phase and group path variation, Doppler shift, Faraday rotation, dispersion, Total Electron Content (TEC), diurnal variation of scintillation, and the global morphology of scintillation. In the section entitled, "Space Weather Support for Systems," the focus shifts to military Command, Control, Communications, and Intelligence (C3I) requirements.Attention is given to such significant systems as: GLOBALink/HF, HFDL, FAA WAAS, and the benefits of space weather information.Considerable space is devoted to forecasting and prediction services and systems including NOAA, RWC Canada, RWC Australia, JPL, Rutherford Appleton Laboratory at Oxfordshire, England, RWC Warsaw & IDCE, RWC Brussels & SIDC, and military systems such as the Air Force Weather Agency at Scott AFB. Commercial services as NWRA, RPSI, and STD-Canada are also described. Considerable space is devoted to research activities including the National Space Weather Program, Military Space Weather Involvement, and the international involvement of COST Actions, the European Space Agency, Sweden, France, Japan, Canada, and Australia.Also discussed is the work of URSI, COSPAR, SCOSTEP, ITU-R, NCEP, and CSWIG. Finally, the activities of CEDAR, GEM, SHINE, CISM, and CAWSES are outlined. Sufficient information is provided to give the reader a good understanding of each project without exhaustive explanations of the technical details. The Epilogue consists mainly of a lengthy dialog between Dr.Ernest Hildner, Director of the NOAA Space Environment Center at Boulder, CO, and Dr. Goodman (author) worthy of analysis.It closes with an 11-page list of acronyms which is very valuable in cutting through the terminology fog. The volume includes a number of reference lists which identify the most recent studies supported by many tables and figures which illustrate the text. The author has drawn heavily on his more than three decades of research (1960-1991) at the Naval Research Laboratory in Anacostia for this volume. The reviewer was stationed at NRL during 1945 and is aware of the significance of the experiments conducted there during its long history. 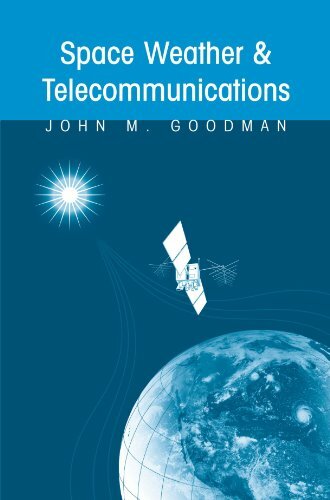 Dr. Goodman has produced a book which is readable and presents a comprehensive up-to-date overview of the relationship of space weather and the telecommunications field. Written primarily for physical science specialists and engineers it also will be useful to licensed amateur radio operators engaged in voice, CW, and data communications who must deal with the practical impact of propagation every time they are on the air.